Author(s): Whatman, J., & MacDonald, J. A literature review prepared for the Education Council that you can read on the Education Council website. 1. What are the features of high quality practica that have a positive impact on outcomes for student teachers? 2. 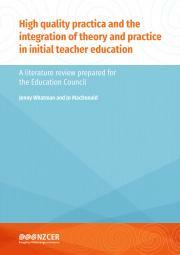 What are the features of high quality theory and practice integration within other parts of the ITE programme (course work) that have a positive impact on outcomes for student teachers? Reviewing the game plan: What can be learnt from the first year of Play.sport? Author(s): Boyd, S., MacDonald, J., Stevens, E., & Felgate, R.
This report presents baseline and implementation data gathered from a range of Play.sport stakeholders during 2016. The report aims to assist Sport New Zealand (Sport NZ) and other decision-makers to consider what the data suggests might be next steps for the initiative. This formative focus is appropriate for Play.sport as the initiative uses an emergent model, and is in the first year of development. Author(s): Bourke, R., MacDonald, J., Lucas, M., Williams, J., & Sheerin, M.
A book chapter written for Student Perspectives on School. Informing Inclusive Practice. Bourke, R., MacDonald, J., Lucas, M., Williams, J., & Sheerin, M. (2018). Enriching the wellbeing of young adolescents in secondary school. In J. Berman & J. MacArthur (Eds), Student Perspectives on School. Informing Inclusive Practice (pp. 177–196). Leiden: Brill Sense. The parent and whānau survey comprised mostly closed-response questions, but also asked for comments about three aspects: learning with digital technology, National Standards, and their child’s schooling in general. Ākonga Māori (Māori students) should be able to have good educational experiences that recognise and support their identity, reo Māori, and culture in any school they attend, as well as their learning. The big picture vision of The New Zealand Curriculum says it is important to foster students' dispositions to learn and contribute as active members of society. The key competencies directly support this vision. This paper looks at what happens when teachers design rich tasks to draw on all aspects of the key competencies. 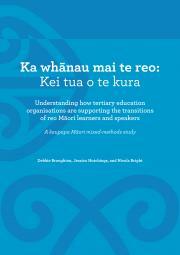 Ka whānau mai te reo: Kei tua o te kura—Understanding how tertiary education organisations are supporting the transitions of reo Māori learners and speakers completes the series of research reports looking at the transitions between education organisations, from pre-school to tertiary. This report looks at the work of teachers in primary and intermediate schools. 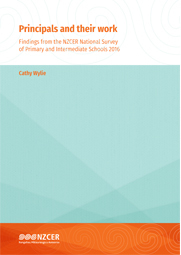 The report draws on data from the NZCER National Survey of Primary and Intermediate Schools 2016 that was conducted from August to September 2016. The survey asked teachers about what they are doing in classes; their school culture and support for their work; their achievements; their issues; and their workload and morale. The 2016 survey continued our focus on how teachers were using aspects of The New Zealand Curriculum that was introduced in 2007. This report looks at principals’ perceptions of how well primary and intermediate schools are resourced and supported, and their relationships with other schools. 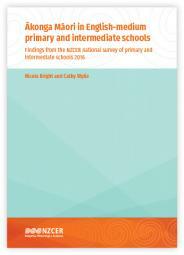 This report looks at the work of principals in primary and intermediate schools. The survey asked principals about their workload and morale, their leadership development; their professional learning, their achievements; their challenges; and their career path. 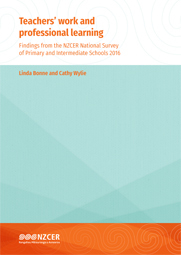 The NZCER survey got responses from a nationally representative sample of 349 English-medium state and state-integrated primary and intermediate schools.